The Vacuum Mobile 1304G is our most compact insulation vacuum will make smaller insulation removal jobs a breeze. 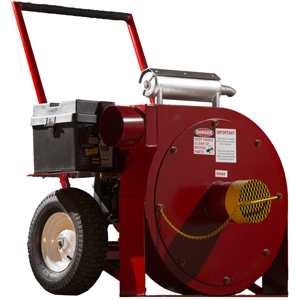 The Star Machine Vacuum Mobile 2406G insulation vacuum is our most powerful, and most versatile insulation vacuum with a removable handle, it can be strapped down and mounted or wheeled anywhere you need with the large industrial tires. The Mounted Vacuum 2406G is our most powerful insulation vacuum; with the ability to remove entire batts of insulation without breaking them up - this the workhorse you have been looking for. All Star Machine Insulation Vacuums are powered by Genuine Honda® Engines. We use Honda® Engines for their world-renowned reliability, and efficiency. These engines all come with electric start, quick-change oil plugs, and a digital hour meter. 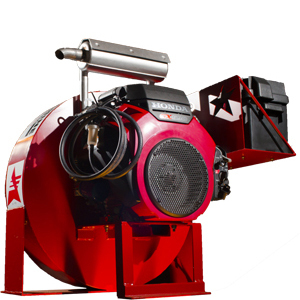 Star Machine Vacuums come in two different intake diameters: 4" on our smaller machine, and 6" on our larger machines. 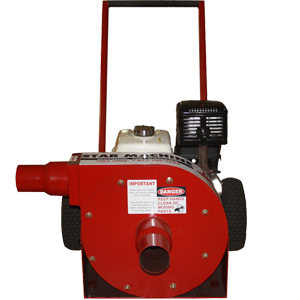 We also offer a 6" to 4" reducer for those who want the power of our larger machine, but the convenience of 4" hose. The fan inside the vacuum is offset to allow for more material to flow through the highest volume area faster, generating a more consistent vacuum. Insulation is immediately shredded as it is sucked into the vacuum, expelling smaller more manageable chunks for disposal. With the handle removed to save space, the Star Machine 1304G and 2406G Mobile Insulation Vacuum can be mounted to the floor of a truck or trailer with straps. If you are looking for a permanent mount machine - check out our 2406G Mounted Vacuum which is made to be permanently mounted to the floor of a trailer or truck. Give us a call or send us an email to get a quote on your custom Star Machine! Every Star Machine is hand built in our shop here in Oxford, Nova Scotia. From here they are shipped to successful businesses all over the world. If you would like to learn more, or if you have any questions please call us toll free at 1-877-782-7883 or email us by clicking the link above.